Given the high degree of piracy in China — Ars Technica quotes a BSA study that claims that “74 percent of commercial software in China is unlicensed” — this is actually a very clever move that will let MS find out who’s using their software and, hopefully, bring them into the fold of paying customers for add-ons such as Office 365 subscriptions, media subscriptions, and so forth. 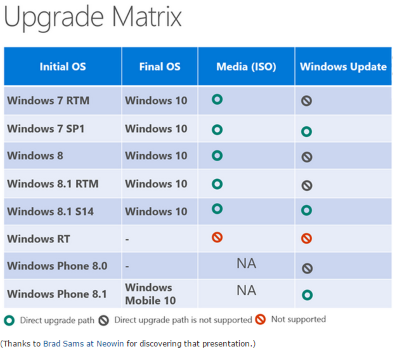 In addition, Ed Bott over at ZDNet followed up with MS and reported further that “…the plan to allow free upgrades for non-genuine copies of Windows applies to all markets and is not limited to China.” Bott even released this helpful upgrade matrix chart that shows how the upgrades will go, incidentally also revealing that Windows 7 users are eligible for the free upgrade as well. This is interesting news, and should be well-received globally, especially in those parts of the world where piracy is overlooked or tolerated. I think it’s a great way for MS to hook up with such users, and could redound to their benefit in the longer term. At any rate, it should be very interesting indeed to see how it all plays out and if it will ultimately pay off. Meanwhile, we in the US will have to pay $600 per upgrade! I thought it was free for the first 12 months?